Jugo Juice was founded in 1998 in Calgary, Alberta with the goal to offer consumers a necessary alternative to mainstream fast food. With obesity-related diseases on the rise, and the increasing challenge of finding time to eat healthy in our fast-paced world, Jugo Juice saw smoothies as the medicine chest of the future. Building around this core product, the menu has expanded with consumer demand to include fresh-pressed juice, and grilled wraps and paninis. The ingredients have evolved, and will continue to do so as we educate customers on the benefits of healthy food choices, and ultimately find better and better ways to fulfill their goals for a healthy lifestyle. “After many successful years in the business, experience has taught us to never give up striving to be better. Hey, if you are going to be working anyway, why not be working on something great? !” says founder Jason Cunningham. From basement experiments in the early days to the boardroom conferences of today, the leadership at Jugo Juice stays true to their roots. Since the very first moment when they saw the opportunity to be a catalyst for change in the food and beverage industry, the original founders are still passionately leading the team in the direction of excellence: visiting orchards, talking with producers and suppliers, and working to always source the highest quality ingredients and new flavors. 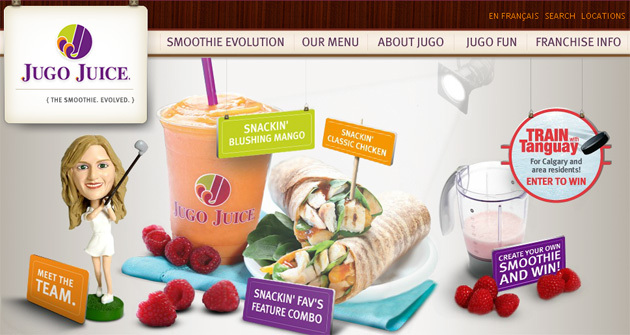 Started as a private enterprise, Jugo Juice now operates through a franchise business model, built successfully around owner-operated locations. It offers a rewarding business opportunity for our partners, and provides a turn-key model for growth in shopping centers, office towers, street fronts, and transportation hubs.